A quality assurance team from the 45th Launch Group off-loads an Air Force GPS IIF-12 satellite from a C-17 Globemaster III on Cape Canaveral Air Force Station, Fla., Oct. 8, 2015. A crowd from the government and industry partnership, who will complete the satellite’s final assembly, gathered on the Cape’s “Skid Strip” to watch the off-loading of the satellite they will prepare to launch aboard a United Launch Alliance rocket in 2016. The last Air Force GPS IIF in a block of 12 satellites was delivered to Cape Canaveral Air Force Station, Fla., from Boeing’s manufacturing facility in El Segundo, California, Oct. 8 via a C-17 Globemaster III. A crowd from the government and industry partnership, who will complete the satellite’s final assembly, gathered on the Cape’s “Skid Strip” to watch the off-loading of the satellite they will prepare to launch aboard a United Launch Alliance rocket in 2016. Although there have been other models of GPS launched into space, the Airmen-led processing team at Area 59 is particularly proud to begin preparations to send the last IIF block satellite into orbit. They’ve been behind every launch of the series since the first GPS IIF launched here in May 2010. 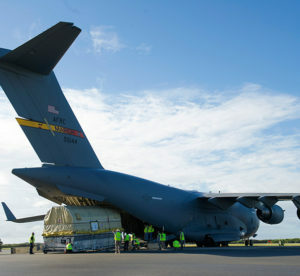 The Boeing-assembled GPS IIF 12 that arrived at the Cape Canaveral will undergo a series of prelaunch preparations, checks and rehearsals. 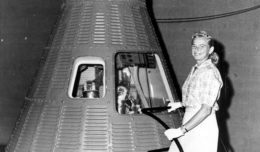 These included functional checkout of the spacecraft, compatibility testing, battery installation, fueling, mating to the payload adapter and obtaining a final flight weight. Members of the quality assurance team range from young military officers to career enlisted troops and seasoned civilians. 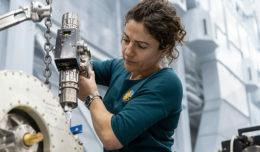 A field program manager for the team interfaces with 45th SW leadership, the Air Force SMC and the contracted partners throughout the months in between the satellite’s delivery and its launch. The Evolved Expendable Launch vehicle is used to launch GPS satellites from Cape Canveral into nearly 11,000-mile circular orbits. While circling the Earth, GPS satellites transmit extremely accurate timing data on multiple L-band frequencies. 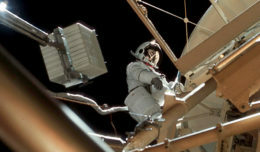 Design life across the satellite blocks range from 7.5 to 12 years, but many are lasting more than 20 years, with the oldest vehicle turning 25 in November 2015. The GPS Master Control Station, operated by the 50th SW’s 2nd Space Operations Squadron at Schriever Air Force Base, Colorado, is responsible for monitoring and controlling the GPS as a 24-satellite system, consisting of six orbital planes, with a minimum of four satellites per plane. There are currently 39 vehicles in the GPS constellation. GPS satellites serve and protect U.S. warfighters by providing navigational assistance and timing standards for military operations on land, at sea and in the air. Civilian users around the world also use and depend on GPS for highly accurate time, location, and velocity information.